Guess what American gun-maker has been building guns for two centuries? 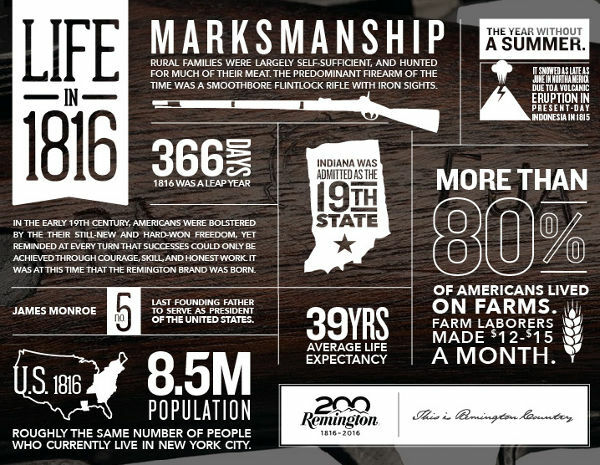 That’s right, Remington Arms Company celebrates its 200th year in business in 2016. 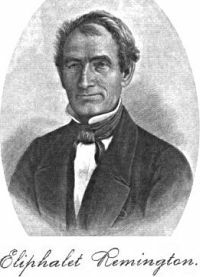 The Remington enterprise was founded in 1816 by Eliphalet Remington in Ilion, New York, as E. Remington and Sons. Remington is America’s oldest gun maker and is still the largest U.S. producer of shotguns and rifles. CLICK HERE for 200 facts about the 200-year-old company. Since 2007, Remington Arms has been part of the Remington Outdoors Group, which is owned by Cerberus Capital Management. Remington recently opened a new plant in Huntsville, Alabama which produces Modern Sporting Rifles (MSR) and Remington 1911 R1 pistols. Interestingly, Remington also operates America’s oldest factory that still makes its original product (guns). Remington has also developed or adopted more cartridges than any other gun-maker or ammunition manufacturer in the world. 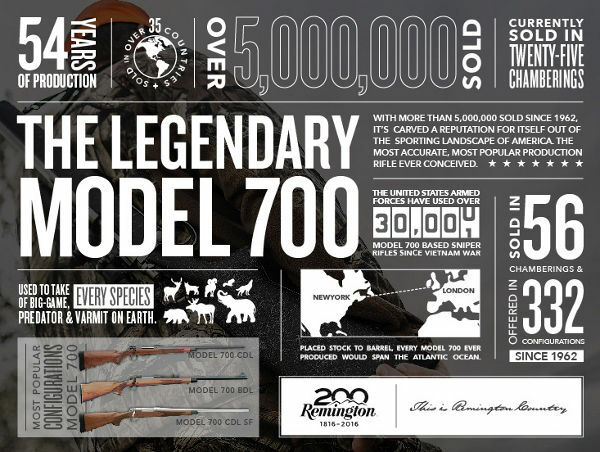 Here are some interesting facts about the Remington 700 rifle. Did you know that over 5,000,000 Rem 700s have been produced, in 56 different chamberings? Laid end to end, the five million Rem 700s could span the Atlantic ocean. 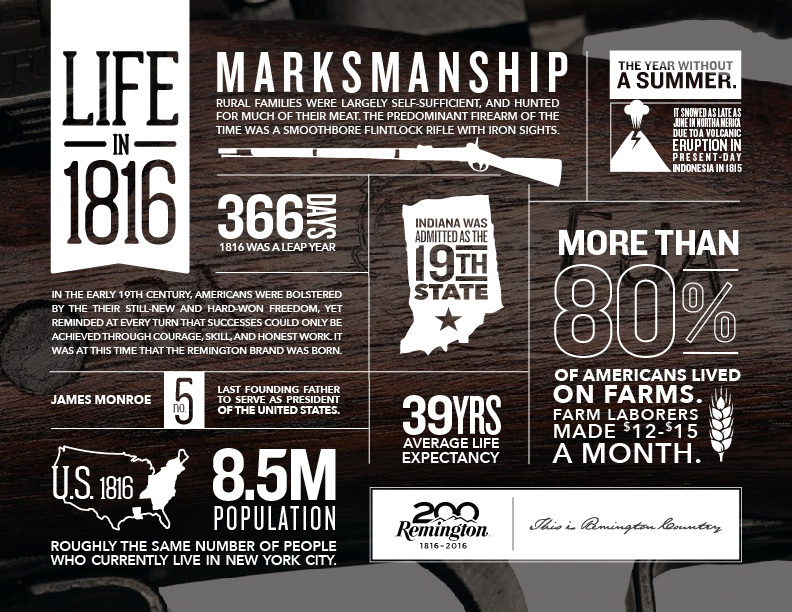 To celebrate its 200th Anniversary, Remington is releasing a special Bicentennial Series of “limited edition” rifles, shotguns, and pistols. Here is the 200th Year Anniversary Limited Edition Model 700, which features a high-grade stock with Fleur de Lis checkering, American-style engraving with gold inlay, and grip medallion. Remington will make no more than 2016 of these rifles, priced at $2399.00. Share the post "Happy 200th Birthday Remington"
African bush metallic sights? How to mess up the looks of an otherwise nice looking rifle – esp one in 7mm Rem Mag. That noted, the linked page says “Starting at $2399.00 MSRP”, so maybe you can pay more and get less. Definitely the most successful gun company in American history.